ALL INQUIRIES AND CORRESPONDENCE WILL BE ANSWERED PROMPTLY BY JANET JEZEK THE OWNER OF THE VILLA. THE TOTAL RATE INCLUDES THE DEPARTURE CLEANING, SEA PINES CAR PASS FOR ONE WEEK, 10% ACCOMMODATION TAX, AND THE HOMEAWAY/VRBO SERVICE FEE. WINTER VISITORS: WE OFFER A DISCOUNTED RATE DECEMBER 2019 THROUGH APRIL 11, 2020 FOR A MINIMUM RENTAL PERIOD OF 28 NIGHTS. THE ADDITIONAL WEEKLY CAR PASSES WILL BE ADDED TO THE RATE AFTER THE VILLA IS RESERVED. PLEASE CONTACT JANET WITH ANY QUESTIONS BEFORE RESERVING. 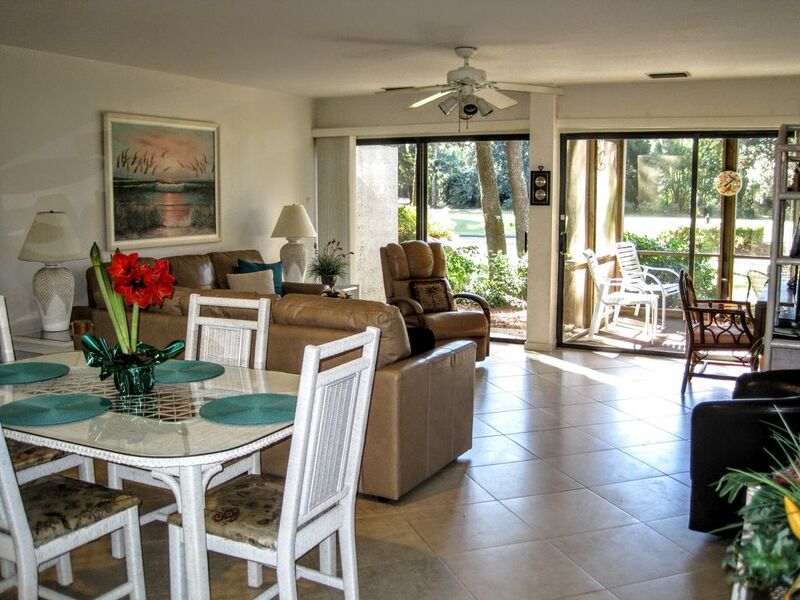 OUR HOME IN SEA PINES IS A PERFECT LOCATION FOR A TROPICAL ROMANTIC GETAWAY, A GOLF RETREAT, OR A FAMILY VACATION. WE HAVE A KEYLESS ENTRY, AND PARKING IS DIRECTLY IN FRONT OF THE VILLA. THIS A GROUND LEVEL VILLA, AND THERE ARE NO STAIRS ANYWHERE IN THE VILLA. WE ARE CENTRALLY LOCATED IN SEA PINES /HARBOUR TOWN. PLEASE READ SOME OF OUR 137 REVIEWS WRITTEN BY GUESTS THAT HAVE STAYED IN OUR HOME. NO PETS ARE ALLOWED. HILTON HEAD WAS VOTED NUMBER ONE AGAIN THIS YEAR BY CONDE NAST TRAVEL AND LEISURE MAGAZINE AS THE BEST ISLAND IN THE CONTINENTAL UNITED STATES. THE LIVING ROOM FEATURES VERY COMFORTABLE SEATING WITH ALL LEATHER FURNITURE INCLUDING TWO LARGE SOFAS (QUEEN SLEEPER) AND A LEATHER RECLINER. WE HAVE A SAMSUNG HD TV, BLUE RAY, STEREO, AND A LARGE LIBRARY OF OVER 100 DVD MOVIES FOR YOUR ENJOYMENT. GUESTS CAN ACCESS THEIR NETFLIX AND AMAZON PRIME ACCOUNTS. THE MASTER BEDROOM HAS A PREMIUM KING SIZE BEAUTY REST BED, SAMSUNG HD TV, BLUE RAY, AND LARGE HIS AND HER CLOSETS. THE MASTER BATHROOM HAS A RAIN SHOWER WITH A SEAT IN THE SHOWER AND GRANITE COUNTER. IN THE GUEST BEDROOM WE HAVE TWO VERY COMFORTABLE DOUBLE BEDS, A SAMSUNG HD TV, BLUE RAY, AND A LARGE CLOSET. THE GUEST BATHROOM HAS A TUB/SHOWER COMBINATION, AND GRANITE COUNTER. THE GUEST BATHROOM CONNECTS TO THE GUEST BEDROOM AND ALSO HAS A DOOR TO THE HALLWAY. OUR HOME HAS A SPACIOUS SCREENED PORCH WITH LARGE CEILING FAN, WET BAR, WEBER CHARCOAL GRILL, UTILITY ROOM WITH A FULL-SIZE WASHER AND DRYER, FREE LONG DISTANCE AND HIGH-SPEED WIRELESS INTERNET ACCESS. SEA PINES IS THE LARGEST AND BEST KNOWN RESORT ON HILTON HEAD ISLAND. IT HAS BEAUTIFUL BEACHES, ACRES OF FOREST PRESERVE, THREE GOLF COURSES, RACQUET CLUB, RIDING STABLE, AND 17 MILES OF MOSTLY SHADED PAVED BIKE AND WALKING PATHS THAT SURROUND THE ENTIRE PLANTATION. IN HARBOUR TOWN THERE ARE MANY SHOPS, GREAT RESTAURANTS, THE MARINA, AND THE FAMOUS LIGHTHOUSE. DURING THE SUMMER MONTHS THERE IS LIVE MUSIC OUTSIDE AT THE QUARTERDECK. EVERYONE LOVES THE CRAZY CRAB FOR EXCELLENT SEAFOOD. GREGG RUSSELL ENTERTAINS THE CHILDREN AND ADULTS DURING SUMMER MONTHS UNDER THE BIG OAK TREE EVERY NIGHT EXCEPT SATURDAY. HIS SHOW IS A 'MUST SEE' AND STARTS AT 8 PM. OUR GUESTS RECEIVE A DISCOUNTED RATE FOR BICYCLE RENTALS. YOU CAN PICK THE BIKES UP OR THEY OFFER FREE DELIVERY AND PICK UP AND INCLUDE A BASKET AND LOCK. IN SEA PINES THERE ARE THREE BEAUTIFUL CLUBS THAT SERVE LUNCH AND DINNER. THEY ARE THE SEA PINES BEACH CLUB, (COAST RESTAURANT) THE HARBOUR TOWN GOLF CLUB, (LINKS RESTAURANT) AND THE HERON POINT GOLF CLUB. (FRASER'S TAVERN) THERE IS UPSTAIRS DINING AT THE SEA PINES BEACH CLUB IN THE EVENING. (AGE 21 AND OVER) AT THE OCEAN LOUNGE WITH LIVE JAZZ ENTERTAINMENT TUESDAY AND THURSDAY NIGHTS. WE ARE ONE MILE FROM THE SEA PINES BEACH CLUB. SPEND THE DAY SWIMMING IN THE OCEAN AND ENJOYING THE BEACH. YOU CAN EVEN RIDE YOUR BIKE ON THE BEACH. SEA PINES HAS STARTED A FREE BEACH SHUTTLE THIS YEAR THAT WILL OPERATE SEVEN DAYS A WEEK FROM 9 AM TO 5 PM BETWEEN MARCH 23, 2019 THROUGH SEPTEMBER 2, 2019. (LABOR DAY) DURING THIS PERIOD A GUEST MAY TAKE THE FREE SHUTTLE TO THE BEACH CLUB. THEY WILL NOT BE ABLE TO PARK AT THE BEACH CLUB BETWEEN 9 AM TO 5 PM. OUR GUESTS CAN PURCHASE A POOL PASS AT THE SOUTH BEACH POOL. (3 MILES FROM VILLA) A DAILY POOL PASS IS $15.00 FOR YOUR ENTIRE GROUP OF UP TO SIX PEOPLE. A WEEKLY POOL PASS IS $75.00 FOR YOUR ENTIRE GROUP OF UP TO SIX PEOPLE. EVERY KIND OF WATER SPORT IS AVAILABLE IN SEA PINES (HARBOUR TOWN OR SOUTH BEACH) INCLUDING JET SKIING, EXPLORING BY KAYAK, CANOE, PADDLE BOARDING, AND PARASAILING. WE HAVE GREAT FISHING IN THE FRESH AND SALT WATER PONDS IN SEA PINES. PURCHASE A $5.00 LICENSE AT THE CSA BUILDING. (GOOD FOR YOUR ENTIRE GROUP) THE REDFISH CAUGHT THERE ARE EXCELLENT! (SEE THE PICTURE.) CATCH SOME BLUE CRABS FOR DINNER. GUIDED HORSEBACK RIDING TOURS INTO THE BEAUTIFUL FOREST PRESERVE ARE AVAILABLE AT LAWTON STABLES. THEY ALSO HAVE PONY RIDES AND A PETTING AREA. TAKE A SELF GUIDED WALKING TOUR THROUGH THE FOREST PRESERVE, AND BE SURE TO VISIT THE BAYNARD RUINS. GET IN SHAPE AT THE FITNESS CENTER. PLAY GOLF ON THE FAMOUS HARBOUR TOWN GOLF COURSE, THE HERON POINT COURSE, OR THE ATLANTIC DUNES (OCEAN COURSE) IN SEA PINES. TAKE A BIKE RIDE TO SOUTH BEACH MARINA, (3 MILES) AND VISIT THE SALTY DOG RESTAURANTS, STORES, AND TEE SHIRT FACTORY. YOU CAN GO OCEAN FISHING ON THE DRIFT BOAT FROM SOUTH BEACH. FERRY BOAT RIDES ARE AVAILABLE TO DAUFUSKIE ISLAND FOR THE DAY TO PLAY GOLF, GO HORSEBACK RIDING, TAKE A BUS TOUR, OR EXPLORE THE ISLAND BY GOLF CART. IN HARBOUR TOWN YOU CAN TAKE A SUNSET CRUISE ON THE 'STARS AND STRIPES' SAILBOAT, A PIRATE SHIP CRUISE, A DOLPHIN WATCHING CRUISE, A DINNER CRUISE ON A POWER BOAT, OR A DAY CRUISE TO SAVANNAH'S HISTORIC WATERFRONT DISTRICT FOR A DAY OF SHOPPING AND DINING ON RIVER STREET. THERE ARE CHARTER FISHING BOATS IN HARBOUR TOWN AVAILABLE FOR A HALF OR FULL DAY OF DEEP SEA OCEAN FISHING. FIREWORKS ARE EVERY TUESDAY NIGHT DURING SUMMER MONTHS AT SHELTER COVE PARK. SHANNON TANNER HAS CHILDREN'S SHOWS AT SHELTER COVE HARBOUR AT 6:30 PM AND 8 PM WEEKNIGHTS DURING THE SUMMER. THERE ARE MANY GOOD RESTAURANTS IN SHELTER COVE OVERLOOKING THE WATER. HILTON HEAD HAS PLAYHOUSES, MOVIE THEATERS, BEAUTIFUL BEACHES, AND EXCELLENT SHOPPING AT THE FACTORY OUTLETS. THERE ARE SO MANY GREAT RESTAURANTS IN HILTON HEAD! ONE OF OUR FAVORITES FOR EXCELLENT FOOD AND LIVE ENTERTAINMENT EVERY NIGHT IS THE JAZZ CORNER. (MAKE RESERVATIONS EARLY) RUBY LEES SOUTH HAS GREAT FOOD AND LIVE ENTERTAINMENT EVERY NIGHT. REILLEY'S AND THE ROOFTOP BAR AT POSEIDON HAVE LIVE MUSIC MOST NIGHTS. SOME OF OUR FAVORITE BANDS ARE TARGET, DEAS GUYS, AND THE HEADLINERS. THERE IS ALWAYS SOME LIVE ENTERTAINMENT PLAYING SOMEWHERE IN HILTON HEAD. CHECK WITH US FOR WHAT'S GOING ON! THERE ARE SO MANY ACTIVITIES IN HILTON HEAD IT IS IMPOSSIBLE TO LIST THEM ALL. IF YOU DECIDE TO RELAX AND COOK AT THE VILLA AFTER AN ACTIVE DAY YOU WILL FIND OUR KITCHEN IS FULLY EQUIPPED WITH EVERYTHING. YOU CAN HAVE DINNER INSIDE OR OUTSIDE ON THE SCREENED PORCH AND ENJOY AN EVENING OF OUR DVD MOVIES. I AM AVAILABLE DURING YOUR VACATION AT OUR HOME BY PHONE, EMAIL, OR TEXT MESSAGE TO ANSWER ANY QUESTIONS OR PROVIDE INFORMATION ABOUT ACTIVITIES OR RESTAURANTS. OUR HOME HAS MANY AMENITIES. YOU WILL NOT BE DISAPPOINTED. WE HAVE TAKEN EXTRA CARE TO BE SURE EVERYTHING IS SUPPLIED FOR OUR GUESTS! Our villa in Sea Pines is our second home, and we have been welcoming guests to our home since 2002 when we started advertising on VRBO. My husband and I live in Lake Worth, Florida. We are retired and have 3 adult children. We used to come to Hilton Head to visit my parents with our children. We loved it so much we decided we wanted a vacation home in Sea Pines. We try to visit as often as possible. Our villa complex (Harbourwood Villas) has only 18 villas and is all at ground level. Most of the villas in Sea Pines are town houses which have two floors. We love being able to have no stairs anywhere in our home and parking directly in front of the villa. The view of the 9th tee of the Harbour Town golf course is great, and our central location (close to everything) in Sea Pines is perfect. Hilton Head is such a change from our home in Florida. We love the biking, crabbing, fishing and wildlife in Sea Pines. We enjoy listening to the live music entertainment and trying out all the great restaurants on Hilton Head island. There are paved bike paths all over Sea Pines and Hilton Head. Many days we go for a 15 or 20 mile bike ride. My husband also likes to fish in all the ponds around Sea Pines. We are very lucky to have a second home in Sea Pines, and we enjoy welcoming guests to our villa. NEW BATHROOMS WITH GRANITE COUNTERS, GREAT SHOWER HEADS IN EACH BATHROOM WITH PLENTY OF WATER PRESSURE. HAIR DRYERS IN BOTH BATHROOMS. SOAPS, SHAMPOOS, CONDITIONERS, AND BODY LOTIONS ARE PROVIDED IN EACH BATHROOM. OUR VILLA IS LOCATED IN SEA PINES THE LARGEST AND BEST KNOWN GATED COMMUNITY ON HILTON HEAD ISLAND. 10 MINUTE WALK TO HARBOUR TOWN. SHORTEST ROUTE-WALK BEHIND THE VILLA AND WALK NEXT TO THE GOLF COURSE PATHWAY. THE VILLA OVERLOOKS THE 9TH TEE OF THE HARBOURTOWN GOLF COURSE. QUIET AND PRIVATE LOCATION. PARKING DIRECTLY IN FRONT OF THE VILLA. OUR HOME HAS A NEW CENTRAL AIR CONDITIONING AND HEATING WITH A VARIABLE SPEED COMPRESSOR, THERE ARE CEILING FANS IN THE KITCHEN, LIVING ROOM, BOTH BEDROOMS, AND THE SCREENED PORCH. ALL BED LINENS AND BLANKETS ARE PROVIDED. WE HAVE A DESK IN THE LIVING ROOM FOR YOUR LAPTOP COMPUTER. THE SPACIOUS LIVING ROOM HAS A SLIDING GLASS DOOR TO THE SCREENED PORCH OVERLOOKING THE NINTH TEE OF THE HARBOUR TOWN GOLF COURSE. NEW GE VERY QUIET DISHWASHER. YOU WILL NOT HEAR IT RUNNING. SPICE RACK AND CONDIMENTS ARE INCLUDED. OUR HOME IS FULLY EQUIPPED WITH DISHES, SILVERWARE, AND GLASSWARE FOR EVERY KIND OF DRINK OR COCKTAIL. THE KITCHEN IS FULLY EQUIPPED WITH EVERYTHING NEEDED TO PREPARE MEALS. LIVING ROOM--HD SAMSUNG TV WITH OVER 300 CHANNELS, ON DEMAND CHANNELS, BLUE RAY DVD, AND STEREO. BOTH BEDROOMS HAVE HD TVS AND BLUE RAY PLAYERS. LOTS OF BOOKS ARE AVAILABLE IN THE VILLA. BEACH TOYS AND BEACH CHAIRS ARE AVAILABLE IN THE OUTSIDE STORAGE SHED. LARGE VIDEO LIBRARY OF OVER 100 DVD MOVIES. RENTALS ARE AVAILABLE IN HARBOUR TOWN AND SOUTH BEACH. BOAT CHARTERS, TOURS, RENTALS AVAILABLE IN HARBOURTOWN AND SOUTH BEACH. THE SCREENED PORCH WITH A CEILING FAN OVERLOOKS THE 9TH TEE OF THE HARBOUR TOWN GOLF COURSE. HAVE MEALS OUTSIDE AND WATCH THE GOLFERS. BEAUTIFUL SUNSETS IN THE EVENING. PARASAILING, PADDLE BOARD, KAYAK RENTALS, AND INSTRUCTION ARE AVAILABLE IN HARBOUR TOWN AND SOUTH BEACH. TENNIS IS AVAILABLE NEARBY AT THE SEA PINES RACQUET CLUB. THERE ARE 3 GOLF COURSES IN SEA PINES . THE VILLA IS ALL AT GROUND LEVEL, NO STAIRS ANYWHERE! PARKING IS DIRECTLY IN FRONT OF THE VILLA. MASTER BATHROOM HAS A SEAT IN THE SHOWER. SMOKING IS ONLY ALLOWED OUTSIDE ON THE SCREENED PORCH NOT IN THE VILLA. NO PETS ARE ALLOWED.